The Globe and Mail has launched an interactive election-forecasting tool that analyzes polling data and helps make sense of it all. Try the election simulator at tgam.ca/election-forecast. 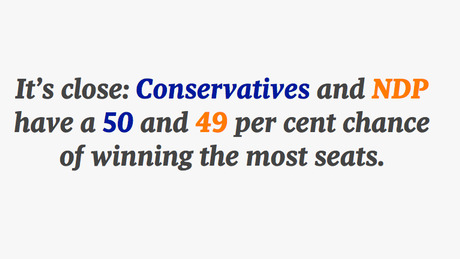 Probability of Conservatives winning most seats: 50.4 per cent. The Conservatives have one-in-two chance of winning the most seats in the election, given the current polling situation. Similarly strong, the NDP place first in most of the other simulations of the Globe's model. While the New Democrats have a small lead in most of the recent polls, their newly-found supporters won't necessarily translate all that well into newly-gained seats. Nearly doubling their support in Alberta compared to 2011, for example, will certainly give the party a heap of new votes as well as a lot of strong second-place finishes, but this doesn't mean they will be able to overcome the usually huge margins of victory for Conservative candidates in Alberta. Estimating a 50-50 chance of an event occurring isn't the predictive equivalent of shoulder shrug, but instead the recognition that at this point in time both the Conservatives and New Democrats have an equally good chance given current conditions, normal campaign changes and past voting behaviour of eventually having the largest caucus in the next parliament. Probability of Liberals winning most seats: 2.9 per cent. The Liberals only win the most seats in 29 of the model's 1,000 simulations. This represents a considerable drop in their chances from a year ago when the party had a clear lead in the polls. The party's low odds might seem puzzling because the polls suggest a close three-way race. Their chances of outright winning the election suffer because of our electoral system, which rewards winning seats – not votes. This reinforces the idea that coming third in a three-way race in Canada is a frustrating experience. The 2012 Quebec provincial election, which had a similar dynamic, is illustrative: while fewer than five percentage points separated the first-place party from third, the winning Parti Québécois elected nearly three times as many members as the third-place CAQ. In most elections, a percentage point here and there doesn't change the elected legislature that follows very much. In a close three-way race, however, it can mean the difference between moving into 24 Sussex and having to look elsewhere for employment. Probability that NDP and Liberals will control a majority of seats together: 97.2 per cent. The probability that the New Democrats and Liberals together will win a majority of the seats is incredibly high, estimated at just over 97 per cent. In most parliamentary systems around the world, this result would have a good shot of ending in a coalition government. However, in recent years, even broaching the topic of forming a coalition in Canada has seemed politically dangerous. In an anti-coalition climate, if the Conservatives have the most seats, and the margin is reasonably large between first and second, you'd have to expect the current government to try to hold on to power in a minority parliament. Would the acceptability of coalitions to Canadians shift if the Conservatives won the most seats, but only by a razor-thin margin? A parliament with three parties nearly tied at 110 seats each might change some minds. Paul Fairie is a University of Calgary political scientist who studies voter behaviour.